Although Shingeki No Kyojin takes a ridiculously long time to unfold its story past the fifth episode, the story is quite a tearful one. As much as I want to say that this type of story (where humanity's existence is in peril and only a trio of characters can save the world) is cliche and omnipresent in the anime world, I can not. The reason being that in this story, nobody is safe. Everyone is at least a hair's length away from death. Even the strongest characters are physically or emotionally injured in some way, making this a unique anime that accurately portrays the life that is lived in a war-torn state. The negative points about the story are the developing pace and the constant, useless recaps. I know that some watchers need that recap but it cuts down the actual episode time. Another problem is the developing pace. After the first five episodes or so, the pace is significantly slower. Tasks that should take an episode are prolonged and stretched to fit over three episodes. An example, I could watch episode 22 and I would only be slightly ahead of the story that was aired in episode 18. This was constantly frustrating since there wasn't really a story to follow in some points. 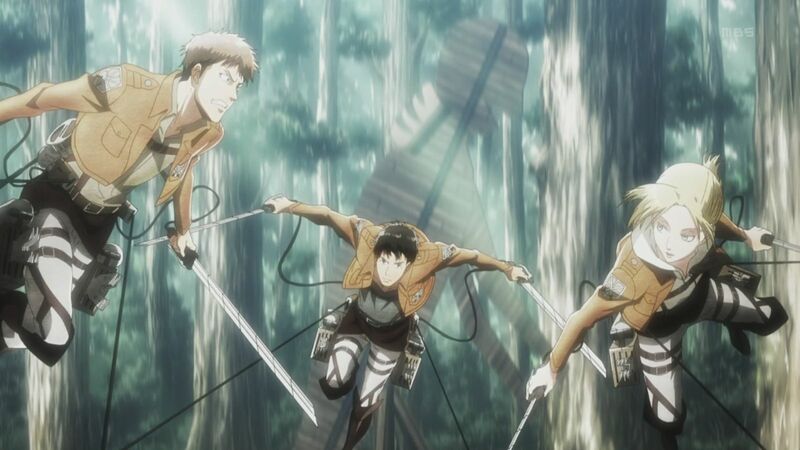 The animation in Shingeki No Kyojin is spectacular. From the first second of the opening, and to the last beat of the ending song, the animation is consist throughout, and there is no drop in quality. Even the 3D maneuver gear had no visible flaws. One could simply stare with their open mouth as Levi would go into Sonic mode to kill the Titans or see Mikasa expertly maneuver herself around on the ground. The various angled scenes add a certain type of intensity and excitement in every mission or battle, really capturing the viewer. to perfect the animation, thank you very much! I fell in love with all the opening and ending songs for this anime. They were well selected and ear pleasing, very energetic and intense. The inserted songs are also fantastic, not asking for too much attention but enough to add dramatic effect or intensity to a scene. One of the best soundtracks that I have heard during the spring and summer season. Throughout this anime, the protagonists face numerous challenges and hardships that they must overcome in order to survival. And when they do, they don't remain the same character anymore, but have changed, even on a fundamental level. The characters themselves were very realistic. Fear is a major theme in this anime and the characters reacted according to that fear. An example would be in the first episode when Hannes attempts to slay an approaching Titan in order to save Eren, Mikasa and their mother. Facing the Titan, you would expect that Hannes will be able to slay the beast and save the kids, since this is anime and everything is possible. However, this particular anime takes into consideration that humans panic, get cold-feet and runaway. They didn't try to hide this fact at all and it makes the anime all the more realistic. You know the common anime phrase, "Main characters. Main characters die everywhere"? This anime basically took that line to the next level. I won't go into detail but there was a moment in the later episodes that took my heart, shattered it, and literally keep rubbing it into my face whenever I would see Levi's face. Although it is a cruel technique, it made the anime more enjoyable for me since I could connect to the characters on an emotional level. The one negative that I have to say about this anime is that it took way to long to go from point A to point B in the story. Detail is good, but having a consistent pace throughout the anime is better. The first five or so episodes left you satisfied and longing for more. After that, however, each episode was filled with previous fillers and recaps, shorten the episode's time and leaving annoying cliffhangers. 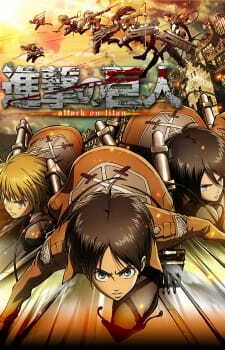 Seemingly over-rated, Shingeki No Kyojin is a terrific anime to watch, containing an interesting story, amazing art, stunning story, and well-developed characters. Certainly not the best-anime-that-has-been-created-ever, but it sure is close.